A Florida box turtle, a land turtle. Modification of Middle English tortou, tortu, from Old French tortüe (under the influence of Middle English turtel, turtur (“turtledove”), see Etymology 2 below), from Medieval Latin tortuca (compare Spanish tortuga), the same source of tortoise (see there for more). (zoology, US, Canada) Any land or marine reptile of the order Testudines, characterised by a protective shell enclosing its body. See also tortoise. (zoology, Australia, Britain, specifically) A marine reptile of that order. (military, historical) An Ancient Roman attack method, where the shields held by the soldiers hide them, not only left, right, front and back, but also from above. (computing) A type of robot having a domed case (and so resembling the reptile), used in education, especially for making line drawings by means of a computer program. (computing) An on-screen cursor that serves the same function as a turtle for drawing. Depending on which version of Logo you have, the turtle may look like an actual animal with a head and four legs or — as in Berkeley Logo — it may be represented as a triangle. (printing, historical) The curved plate in which the form is held in a type-revolving cylinder press. (computing theory) A small element towards the end of a list of items to be bubble sorted, and thus tending to take a long time to be swapped into its correct position. Compare rabbit. (dance) A breakdancing move consisting of a float during which the dancer's weight shifts from one hand to the other, producing rotation or a circular "walk". To flip over onto the back or top; to turn upside down. 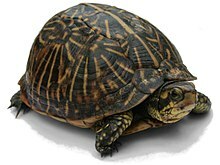 Were speeding when car turtled […] Auto crashed into curb and turtled. To turn and swim upside down. I turtled my board beneath it, flipped upright, and started paddling again. To hunt turtles, especially in the water. Of these, 80 turtled (65%), 26 hunted and turtled (20%), and 18 hunted (15%). (video games, board games) To build up a large defense force and strike only punctually, rather than going for an offensive strategy. From Middle English turtle, tortle, turtel, turtul, from Old English turtle, turtla (“turtledove”), ultimately from Latin turtur (“turtledove”), of imitative origin. (now rare, archaic) A turtle dove. 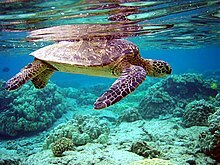 The same he tooke, and with a riband new, / In which his Ladies colours were, did bind / About the turtles neck […] . As the turtle, every day has been a black day with her since her husband died, and what should we unruly members make here? Ultimately from Latin turtur (“turtledove”), of imitative origin.